I WAS stalking around the Lower East Side, having been rebuffed in an effort to photograph the exterior of the Eldridge Street Synagogue (it’s covered with scaffolding during an ongoing renovation). I remembered I wanted to shoot the exterior of 97 Orchard Street, which the Lower East Side Tenement Museum maintains as a preserved slice of New York as it was in the early 20th Century. 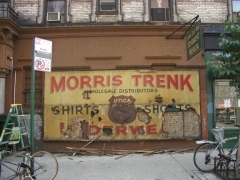 I noted that the museum closed its old store at Orchard and Broome and set up in a new space, 108 Orchard, but on my way there, from the corner of my eye, I saw a splash of color on the wall and peered into another decade. 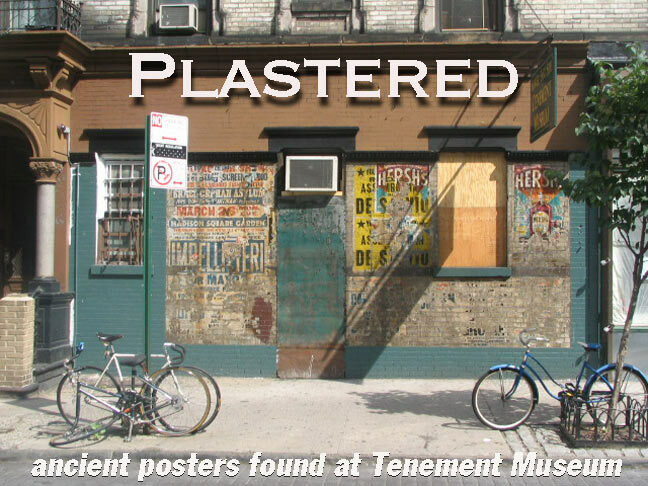 According to Pamela Keech of Curious Curators, who is remodeling the old Tenement Museum space, the Museum will attempt to maintain the remains of these posters within reasonable means. 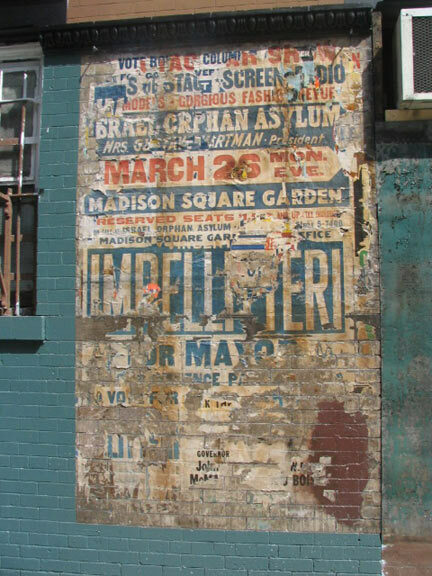 There are about eight or nine posters here on top of each other, creating a pronounced pentimentoeffect. There’s a benefit for the Israel Orphan Asylum; Mrs. Gustave Hartman was the wife of a local assemblyman and philanthropist. (A nearby traffic intersection at East Houston St. and Avenue D was named for him.) 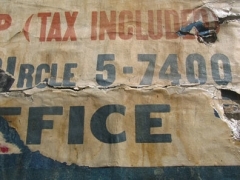 Another piece of the ad advertises a rally for Mayor Vincent Impellitteri, who ran twice for mayor, winning as an independent in 1950 and in 1953 losing in the Democratic primary to Robert Wagner Sr. 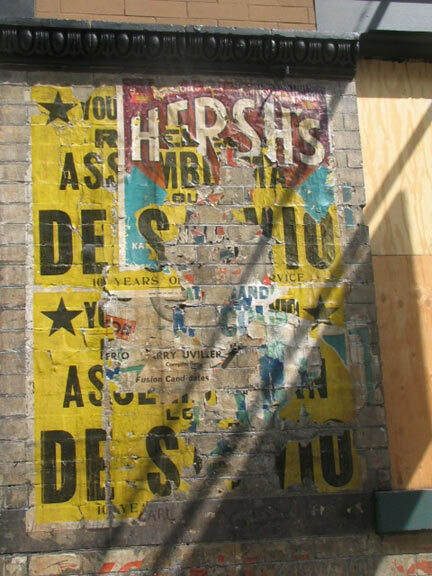 The yellow poster on the right urges the election of Assemblyman Louis DeSalvio. DeSalvio was in the NYC Assembly between 1941 and 1979, the longest-serving member in history. The ‘old man’ DeSalvio was referring to was the project’s mastermind, NYC Parks commissioner Robert Moses. 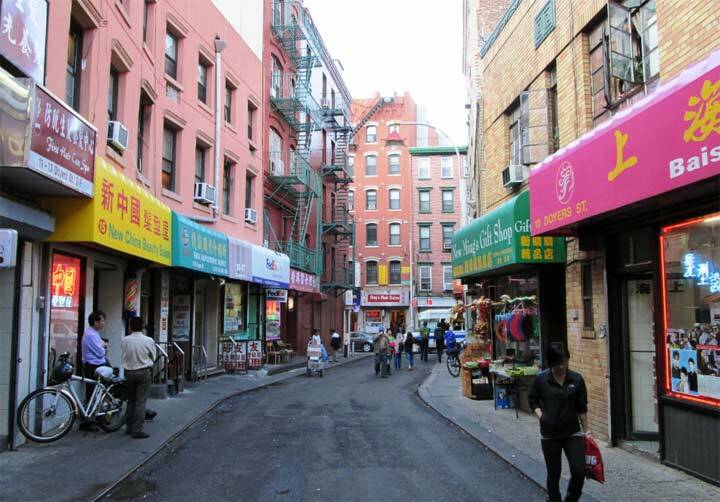 The LME was defeated by a neighborhood coalition led by Jane Jacobs. 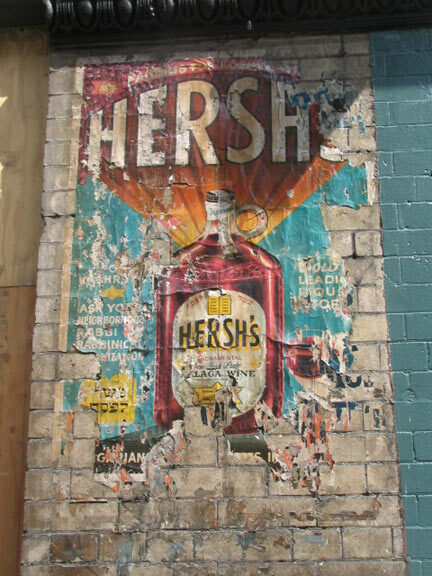 In addition there are a couple of ads for Hersh’s sacramental wine. Haven’t been able to find out anything about the company, though. 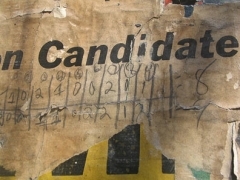 You can see old phone number notation (the initial letters were eliminated in the 1960s) and pencilled-in inning-by-inning recounts of long-ago stickball games. 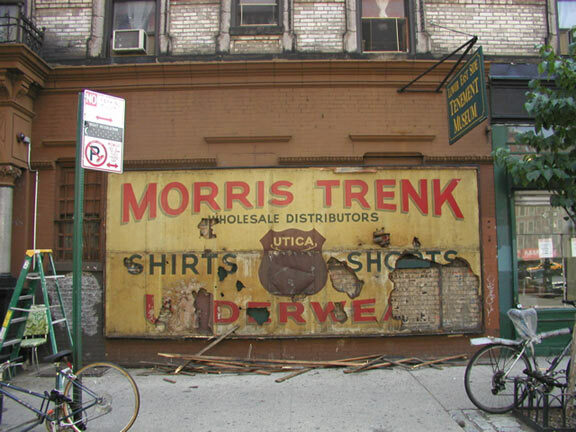 The streets of the Lower East Side are still full of underwear wholesalers. Serendipity, or good luck, sometimes makes for a Forgotten NY page, certainly in this case! Not that your webmaster ever has much of that. HAND MADE. 1940s hand-lettered and neon signs from around town.